Can Gemini men and Libra women have a successful relationship that is compatible mentally, emotionally and sexually? The Gemini Man and Libra Woman both have the same movements as air. Both these zodiac signs enjoy communicating together in order to share their intellectual ideas and be willing to venture off every day together. Eventually though, there are some aspects about the Libra Woman that might start to annoy the Gemini Man. Read on to know more about the Gemini and Libra love compatibility. The Libra Woman has many characteristics that the Gemini Man will find within himself. She is passionate, smart, honest, and flexible like air. She will enjoy almost any topic of discussion with her Gemini mate and will also enjoy the wanderer side to him. The Libra female enjoys spending her time out of the house in order to go visit somewhere either that be to a friend’s house, into the city, or on another adventure. These are all the same qualities of the Gemini male, so these two sun signs will have plenty to do together. Though the Gemini Man and Libra Woman are both flowing like air, they are able to ignite a fire in the bedroom. They will both be passionate and adventurous, willing to try new things in order to keep the excitement up. There are characteristics of the Libra lady that might at sometimes annoy the Gemini Man, but they are also parts of the relationship that might cause a balance that the Gemini Man needs. If he is willing to accept this balance and learn to have a little more patience, then there is no reason why this relationship shouldn’t last a life time. The Libra woman is looking for a life partner and is willing to settle down and get married. This does not mean however, that she will ever want to stop exploring and will want to try new things with her Gemini Man. Libra Women are real sweet talkers while Gemini Men have a lot of charm. These two sun signs complement each other and will help ignite a spark between them very quickly. She is able to offer balance to the relationship because she is a little more organized and refined. She is looking forward to a long term relationship which does include marriage. There are parts of a Gemini Libra relationship that some might see as a con while others just see ways to work inside a relationship. The Libra Woman will sometimes be a little two flexible with her ideas and things that she wants. Though she is more organized than the Gemini Man, he will be tempted to ask her to make her mind up more quickly. Good thing that he too is flexible, but he might need to learn how to be patient from time to time. In the beginning, the Gemini Male might need to put in a little more effort than what he normally has to do in order to charm his Libran lover. She will appreciate all of his flirtatious actions but she also has the intellect to understand the difference between a flirt and a heartfelt comment. But this shouldn’t disinterest a Gemini Man because he enjoys a new challenge and a new adventure. The Libra Woman has more potential to be the dominating one in the Gemini man Libra woman relationship because she will have the ability to think more rationally. This will bring good balance and improve zodiac compatibility in this relationship if the Gemini Man is able to accept some ground rules. Gemini is an air sign that is mutable and Libra is an air sign that is cardinal by nature. 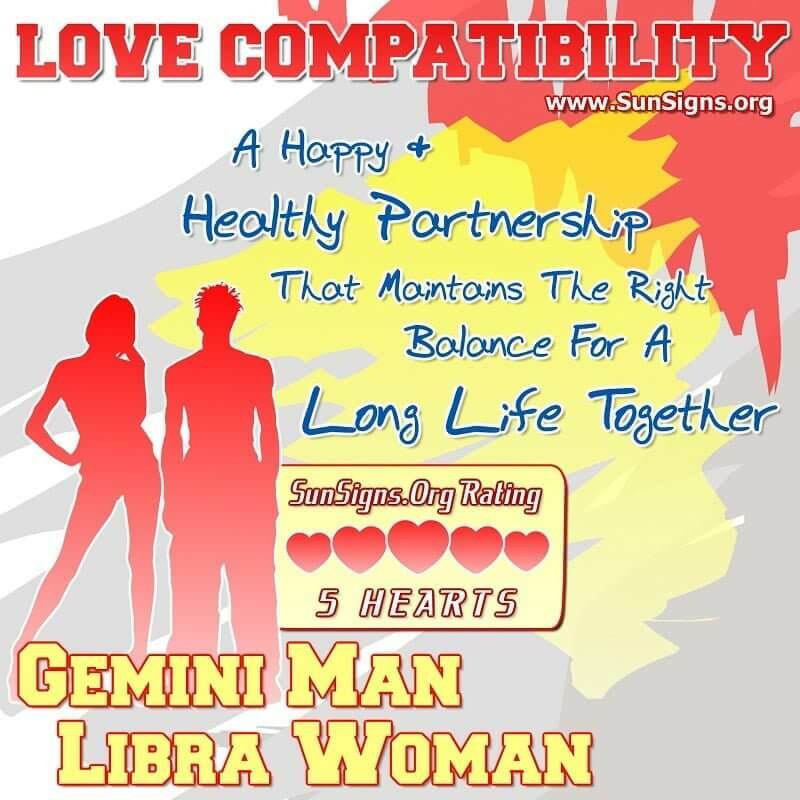 The Gemini man Libra woman compatibility gets a FIVE Hearts love rating. The Gemini Man Libra Woman is a great relationship. The Libra Woman is very similar to the Gemini Man so they will be able to start off a relationship real fast and be able to keep the passion burning between them. OH REALLY? Im a gemini and she was Libra. It worked for a while, but her temper is what killed it.